Psalm 104 is classified as a creation psalm, a rare breed in the book of Psalms. As we see from the above outline, the lectionary text emphasizes the “diversity of creation” and “God’s glory and the singer’s song.” How ought we to read this text as a commentary, an aid, to understanding the Pentecost story in Acts 2? Creation psalms celebrate the sovereignty of God over the created world, and, in the case of Psalms 8, 19, 65, and 148, marvel at or allude to humanity’s special place within creation -- see Psalm 8:3-8; Psalm 19:11-14; Psalm 65:1-5; and Psalm 148:11-14. Not so with Psalm 104. In its beautifully crafted words, humanity takes a decided backseat to God and God’s magnificent creation. Humanity is included in its words in only one place -- verse 23, which reads, in my own translation, “Humanity goes forth to its work and to its labor until evening.” The verse does not single out humanity, but speaks of humanity in the same breath as that of various elements of creation: the moon and the darkness (verses 19-20); the living things of the forest (verses 20); the young lions (verses 21); and the sun (verses 22). The opening verse of the focus lectionary text, state, “O Lord, how manifold are your works! In wisdom (chokmah) you have made them all; the earth is full of your creatures -- literally, the things that are belong to you.” Verses 24-26 recount God’s creative acts, carried out by means of wisdom (verse 24) and are abundant with echoes of Genesis 1: the sea (Genesis 1:6-10); the creeping things and the living creatures (Genesis 1:24); and, yes, even Leviathan, called the great sea monsters in Genesis 1:21. At the end of verse 26, the psalm singer depicts God’s delight in creation, stating “Leviathan -- this you formed in order to “laugh” “play” (in the NRSV, “sport,” from the Hebrew root tsachaq) with it. The word used here is the same word that Woman Wisdom uses to describe her utter delight in creation in Proverbs 8:30. Verses 27-28 describe God’s good provision for creation and verses 29-30 tell of creation’s dependence upon God and God’s ultimate power over creation. Again, humanity is not singled out with any special mention, but rather is depicted as one with all of creation. The glory of God is depicted in verse 32 with images of the earth trembling and the mountains smoking, typical elements of a theophany -- an appearance of God to humanity -- in the Old Testament. See, for example, Genesis 15; Exodus 19; and 1 Kings 19. The psalm singer responds to the theophany in verse 33, not with fear and dread, though, but with a vow to “sing to the Lord as long as I live … praise God while I have being.” She continues with a wish that her meditation (her musings about God) will be pleasing. The singer of Psalm 104 celebrates God’s creation of, care for, and glory over creation. Why should she not cry out to God about the sources of sin and wickedness? The psalm closes in 35b with the same words with which it opens, forming an inclusio, an envelope structure, around the psalm, perhaps indicating that its words are summary words in some way or another. 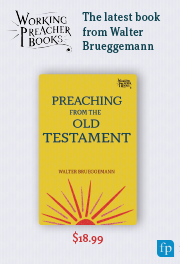 This commentary opened with words of musing: “How ought we read this text as a commentary, an aid, to understanding the Pentecost story in Acts 2?” I offer some tentative insights. The God we encounter in Psalm 104 is the God of creation, and humanity receives only a passing mention (verse 23). God created the world “in wisdom” (verse 24), and along with Wisdom, playfully interacts with his wondrous creation (verse 26). God provides for and is sovereign over creation (verses 27-30); and God’s glory manifests itself in awe-inspiring ways (verse 32). On the day of Pentecost, the people gathered in that room in Jerusalem witnessed an “up close and personal” theophany: a noise, a violent wind, tongues of fire. But the God in this theophany brought a message not of dread, but of hope, to the gathered worshipers. And in Peter’s address to the people, we read a message of inclusion of all humanity (and might I add, all creation?) in God’s vision for the future. And the words of Psalm 104 remind all humanity that they are part and parcel of all creation. Yes, we will prophesy, we will see visions, and we will dream dreams. But to what end? This commentator maintains that the “to what end” has to do with all creation, the glory of our God, and the world with which our God is so intimately involved, even deigning to come down and visit a rag-tag group of followers of Jesus in Jerusalem. Discussion on Revised Common Lectionary texts for Day of Pentecost (June 4, 2017): (Gospel) John 20:19-23; (1st Reading) Acts 2:1-21; Psalm 104:24-34, 35b; (2nd Reading) 1 Corinthians 12:3b-13. 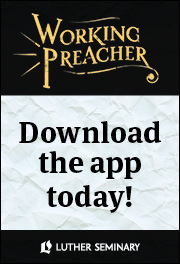 Recorded at 2017 Festival of Homiletics, Travis Park United Methodist Church, San Antonio, Texas, for WorkingPreacher.org. "Descent of the Holy Spirit at Pentecost," detail of mosaic by Anna Wyner at Our Lady of Walsingham. Image by Lawrence OP via Flickr licensed under CC BY-NC 2.0.